Tonight I made it out to Target Field, my 66th venue. 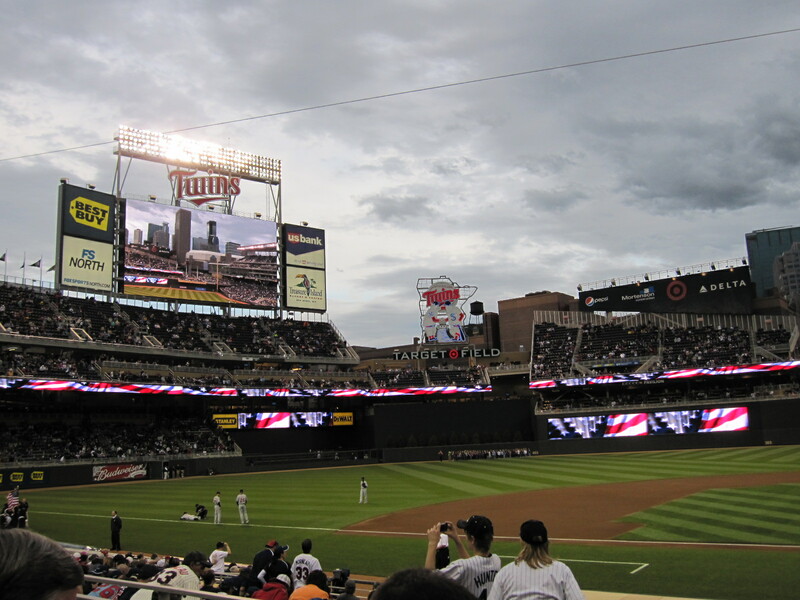 Target Field is the new ballpark for the Minnesota Twins and the Detroit Tigers were tonight's visiting opponents. 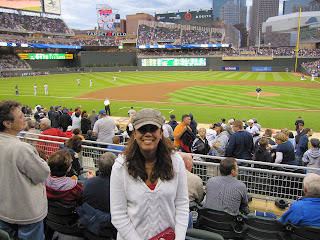 I'd been to Target Field a week or so ago, but there wasn't a game. 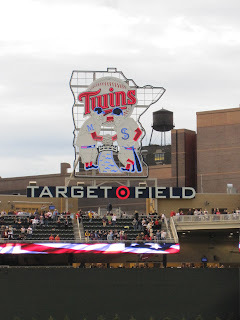 I'd walked over one afternoon when I was in Minneapolis and took some pics of the statues around the park, but it's just not the same as catching a game. 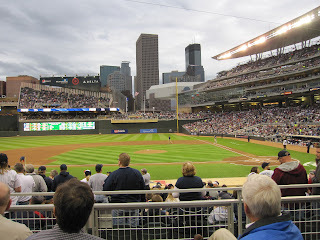 Earlier today, I checked the weather report and although it called for rain, I gambled and headed towards the ballpark. I took the skywalks most of the way to the ballpark and scalped a ticket on the way. 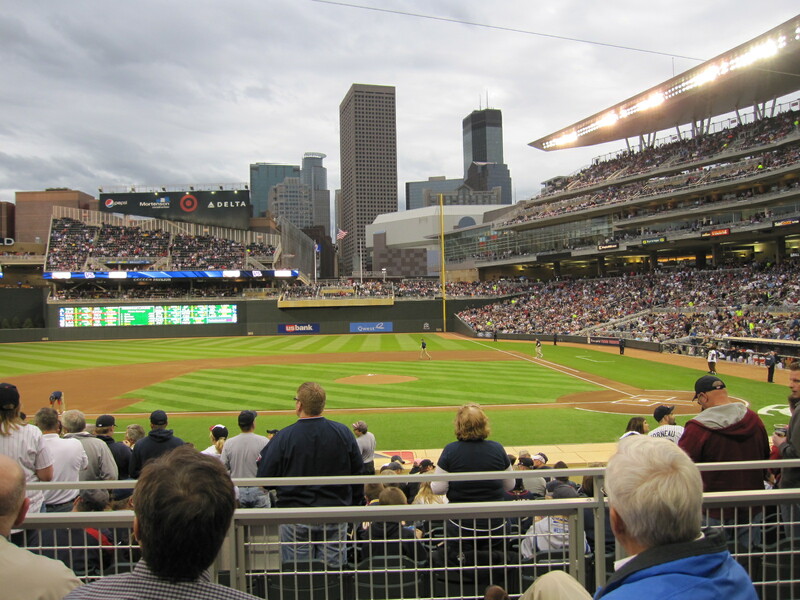 Scalping is legal in Minneapolis. I scored a $57 ticket for $50. 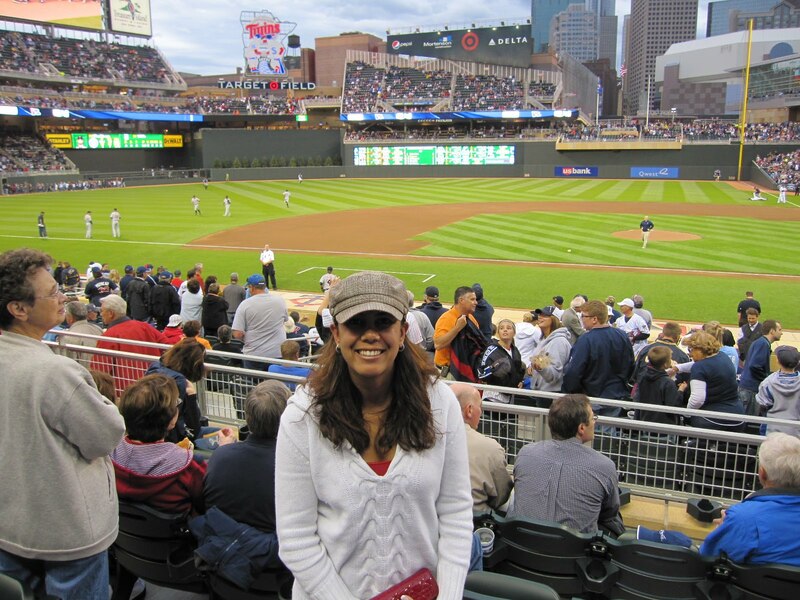 I didn't feel like negotiating, I just wanted inside the ballpark. I like new stadiums. 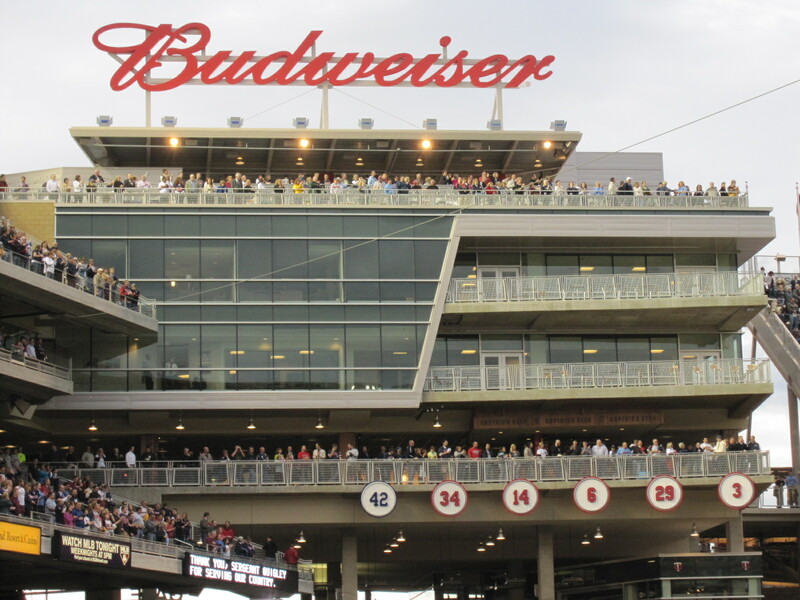 I realize there's a certain degree of sterility with a new stadium, and that some people prefer the charm of older parks (i.e. Fenway, Wrigley, etc.). 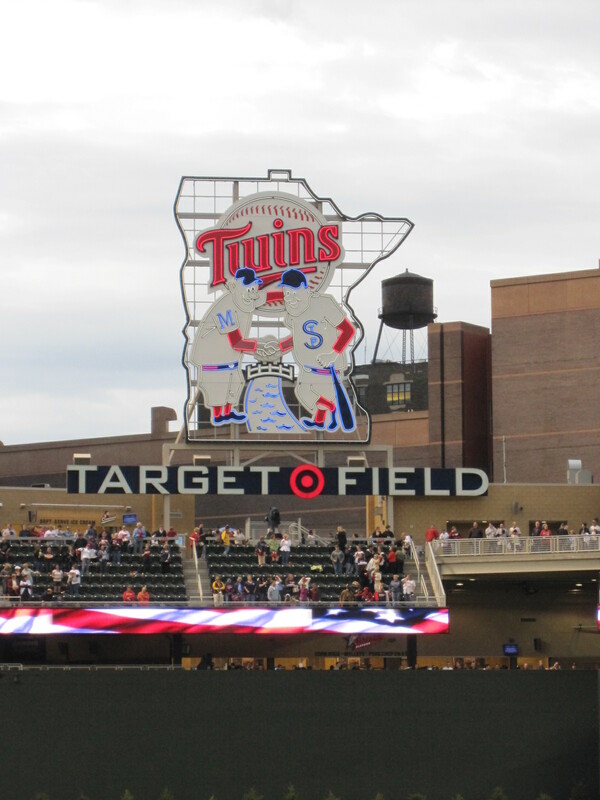 I appreciate both types of stadiums, but I do like "new". Below are some views of the stadium from my seat. 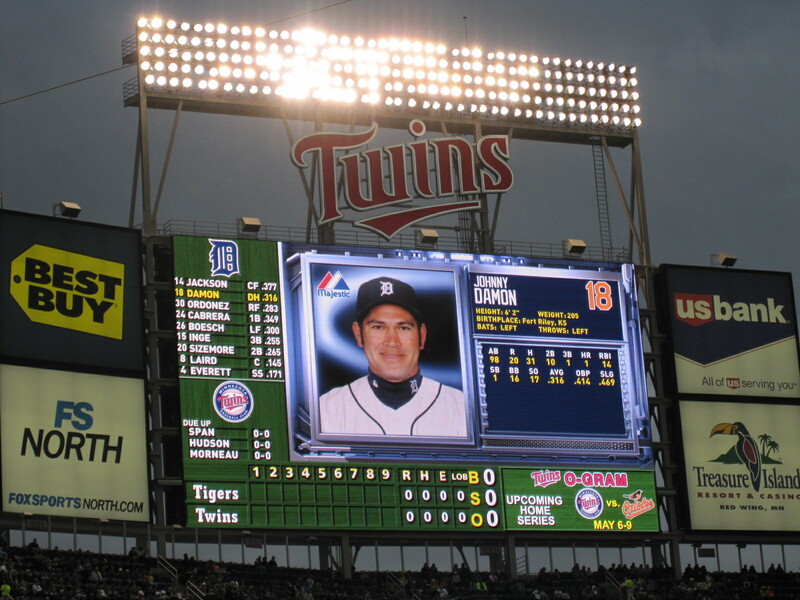 Did you know that Johnny Damon was with the Detroit Tigers now? I didn't. 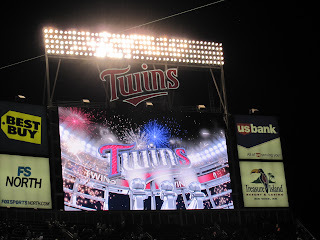 I also didn't realize that Jim Thome played for the Minnesota Twins. I remember Jim Thome from his days in Cleveland with the Indians. He was a great player for the Tribe and a class act. I even have an invitation to his surprise birthday party somewhere with all my "memories" from my days in Cleveland. **** When I was a Cleveland WAG (i.e. Wife and/or Girlfriend) I'd met his wife Andrea at a graduation party for the former Indians' trainer's son, and we had hit it off. I never did make it to that party, but I digress.. Regardless, it's great to see him still playing well. Sure enough it started raining during the game. Like the commercial says, "No rain, no rainbows" right? Ernie Harwell passed away right before the game. For those of you that don't know, he was a Hall of Fame broadcaster for the Detroit Tigers and had battled cancer. He died yesterday at the age of 92. 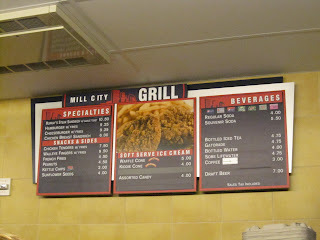 Anyway after about 2 innings with the Twins leading 2-0, I went to the concourse to see what Target Field had to offer. 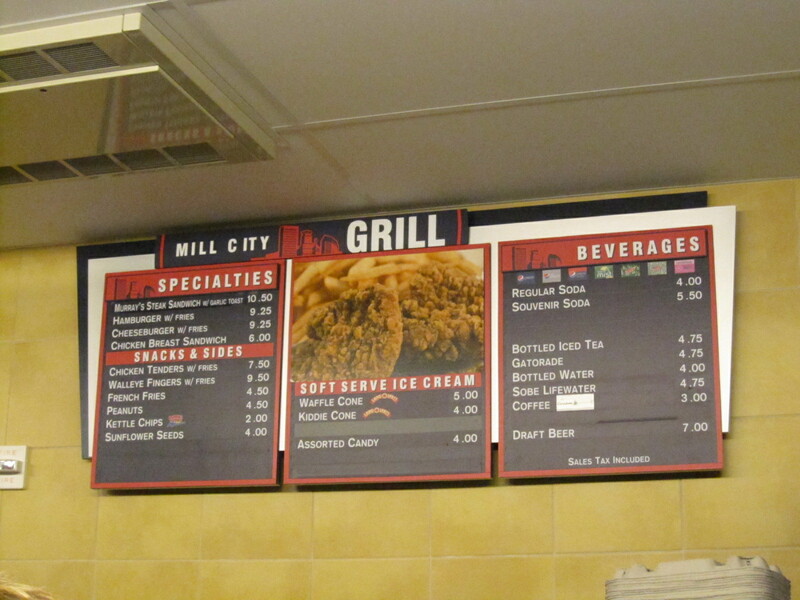 Below is a picture of the menu board for Mill City Grill. I was curious to know how the walleye fingers were, but I chose to try Murray's Steak Sandwich. The steak sandwich was good, but I don't really like it when there's more bread than meat. 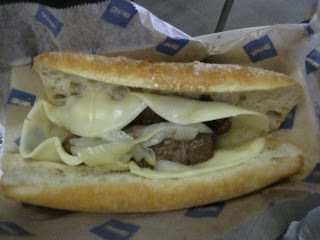 As for the sandwich, there are 2 pieces of steak and it was cooked well. If only I could've put my $10.50 sandwich on the Underhill's tab. **** Did I tell you that Fletch is one of my favorite movies? The concession stand was doing a lot of business (i.e. possibly because of the rain) and people had to wait about 10 minutes for their order to be ready. The people working the stand would take the name of the person placing the order and then call it, when that person's order was ready. I was amazed at how well the "honor system" worked! Oh yeah, I should mention that Target Field now sells Killebrew Root Beer. 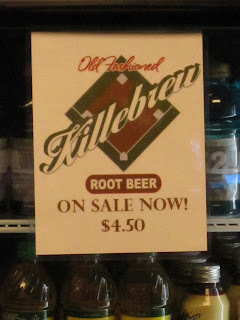 I don't like root beer, but for those of you that do, check it out! 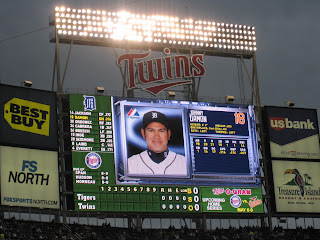 When I returned to my seat the Tigers had tied the game at 2. The Twins took a 3-2 lead in the 6th inning, but the Tigers would end up tying up the game in the 9th. It all came down to the bottom of the 9th inning. 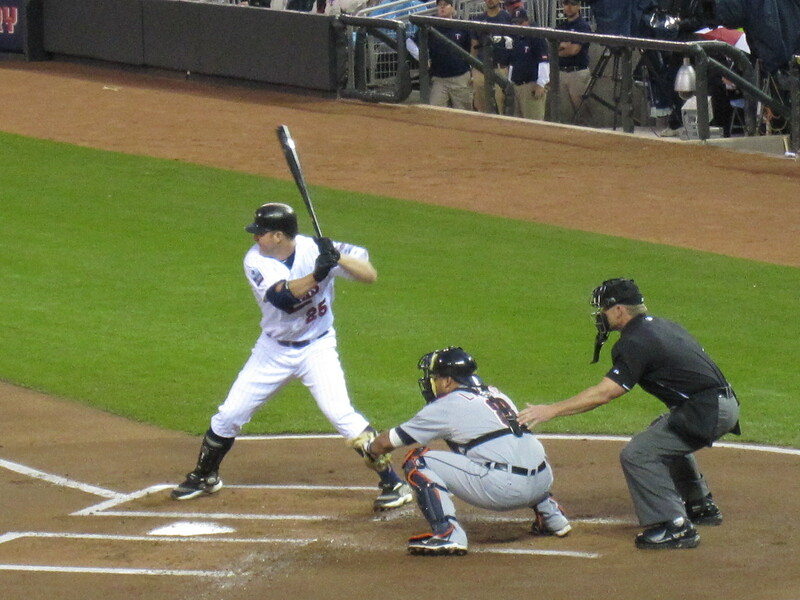 With J.J. Hardy on 3rd and Wilson Ramos at bat, the Tigers' pitcher threw a crazy pitch and Hardy was able to score. Andddddddddddd, guess who happened to be shooting vidoe at that very moment. Yep... It's ME! Enjoy the clip. 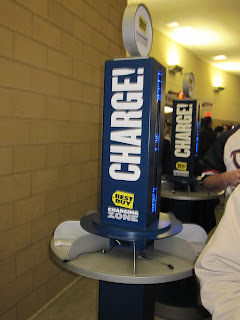 **** I saw these stations for people to charge their mobile phones. I told you I liked new venues. This is a great idea since power users and travelers like myself, rely on having enough juice to function. Thank you, Best Buy and Minnesota Twins for providing this amenity to Twins fans! 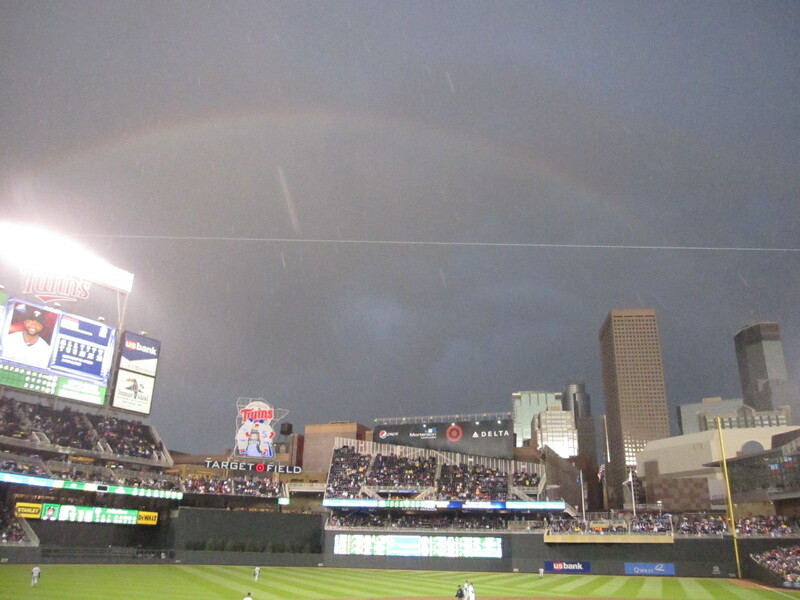 The rainbow you took a pic of over Target Field last PM is being remembered as the Ernie Harwell rainbow as he had just passed away earlier (just before the game). You should repost it with a caption so people searching net can find it. Yours is the best so far!! Thank you for the comment. I'm pleased that I was able to capture the image for Tigers fans everywhere. The Ernie Harwell rainbow was indeed very special. Like the commercial says, "No rain, no rainbows."